Will transit challenge derail pension reform? Bay Area Rapid Transit workers may begin making annual payments toward their pensions under a tentative deal that ended a strike last week. But they are still exempt from cost-cutting pension reforms, unless the state wins a lawsuit filed this month. The deal reportedly would phase in an employee pension contribution of 4 percent of pay over four years. That’s less than the 7 percent of employee pay called for in the regular CalPERS formula for most BART employees. Moreover, the new pension bite from paychecks is offset by a 15.4 percent pay raise over four years. But BART wants to cut rising employer pension costs projected to reach 14.3 percent of pay in fiscal 2015, up about 50 percent since fiscal 2009. It may seem like a giveaway to workers. The new pension reform bans pension pickups for new hires, making employees share the burden and reducing employer retirement costs. If a pension pickup was bargained instead of a pay raise, defenders argue, the swap gave employees a similar dollar amount and employers got savings from avoiding payroll taxes and pension contributions and from pensions based on a lower salary. Now as pension costs go up, after heavy investment losses during the recession, the standard way for employers to get savings, given widely accepted legal limits, is through higher contributions from employees and lower pensions for new hires. Those are two key parts of the pension reform Gov. Brown pushed through the Legislature last year, AB 340, that took effect Jan. 1 except, at this point, for transit workers who have special standing under federal labor law. Following complaints from public employee unions, the U.S. Department of Labor began to withhold $1.6 billion in federal grants to transit districts this year after concluding the pension reform reduced bargaining rights. Brown said in a letter to Labor in May that the reform does not impair bargaining and is needed to preserve pensions. He said his commitment to preserving bargaining was demonstrated by signing the bill authorizing state worker bargaining in 1977. 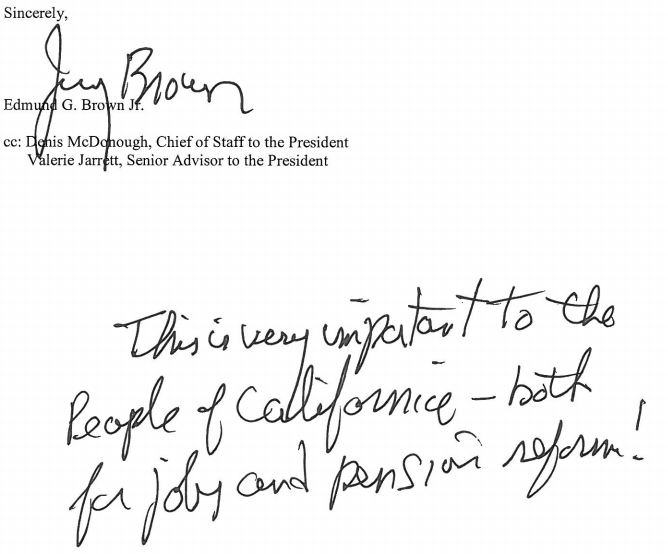 “Pension reform will help prevent more municipal bankruptcies that are tied, at least in part, to pension obligations, as demonstrated by bankruptcy proceedings in Stockton and San Benardino,” Brown wrote to the acting Labor secretary. The new Labor secretary, Thomas Perez, began withholding transit grants on Sept. 4 after briefs from both sides and failed negotiations. Brown signed legislation, AB 1222, on Oct. 4 exempting transit workers from the pension reform until Jan. 1, 2015. State loans of up to $26 million were authorized for transit systems that lost federal funds in the dispute. An early estimate: About 20,000 workers could be exempted from pension reform in many of the more than 80 transit districts receiving federal grants. The federal law requiring the Labor department to certify that transit grant recipients are not weakening bargaining rights was enacted in 1964 to protect private-sector union members. In the previous decade, nearly 200 privately owned transit companies went out of business (see the “General Motors streetcar conspiracy” dispute). Many of the lines were being taken over by local government authorities using federal money. The labor protection clause, section 13(c) of the Urban Mass Transportation Act, is blamed by critics for “giving labor the equivalent of veto power over federal grants,” boosting generous benefits and blocking contracts with private bus and ride-share firms. Backers of the labor clause say a stable, experienced workforce provides a better quality of service and reliability, increasing ridership, while also helping to keep skilled workers in the transit industry as technology changes. In a lawsuit to overturn Labor’s decision on California pension reform, the state said the federal agency went beyond state law and concluded that new hires are entitled to the same pension benefits as current employees. The pension reform mainly affects new hires, following the widely held view that state court rulings mean the pensions of current workers are “vested rights,” protected by contract law, that can only be cut if offset by a new benefit of similar value. The state lawsuit argued Labor’s view that new or future employees are entitled to the pension benefits in the labor contracts of existing employees is based on the National Labor Relations Act, which does not apply to government employees. A skeptic might say the giant California Public Employees Retirement System did not regard the pension reform as a game changer, estimating that the bill will save $12 billion to $15 billion in present day dollars over the next 30 years. But the push for exemption by transit worker unions shows the impact of the reform is not trivial. Transit workers are spread among a number of retirement systems, large and small. The state was joined in the lawsuit by Sacramento Regional Transit District, the first to lose federal funding under the Labor decision. Sacramento RT is one of 25 special districts that operate their own small pension systems. It’s funding level in the latest report to the state controller was 68 percent, similar to the 70 percent reported by CalPERS in recent years. In another district with its own retirement system and a funding level of 63 percent, Alameda-Contra Costa Transit, pensions reportedly are not an issue in a threatened strike. Brown obtained a 60-day cooling-off period last week. This entry was posted on October 28, 2013 at 8:47 am and is filed under Brown, Reforms. You can follow any responses to this entry through the RSS 2.0 feed. You can skip to the end and leave a response. Pinging is currently not allowed. This is just a lesson in the law of unintended consequences why you shouldn’t try to legislate every aspect of society and business. You end up handcuffing everyone to a lightning rod and eventually get quite a shock. The cities, counties, public agencies all sweetened their retirement benefits to keep people from walking out the door during the Dot.Com boom. This short term solution is presenting some unintended consequences today. Trying to solve problems using the “nanny government” mentality is only going to result in a rude awakening. The legislation left open this little perk where the employer pays the employees’ retirement contribution. State workers pay their own contributions. Now, as Ed points out, pay raises are being handed out like so much Halloween candy, that by the time the employee retires from one of these public agencies, their salary will likely be 40-50% higher than it was before the legislation. This because their employer is trying to compensate them for the contribution rates and combine that with their almost annual cost of living adjustment, it starts to add up to real money. State workers get a COLA about every decade. I guess the cost of living does not go up very often for state workers. Unfortunately, citizens have a duty to be involved in their government especially what their local government is doing but most are too lazy (or currently being denied their right) to vote every 2 or 4 years. Please elaborate Bille: Where are U.S. citizens currently being denied their right to vote?